An hour ago we had a 3.8 earthquake in our backyard. 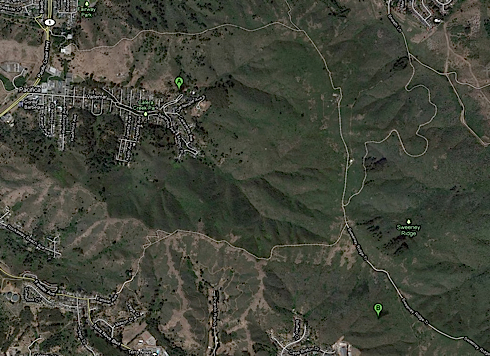 On this Google map “A” is our house in Pacifica, California, and “B” is the epicenter of the quake. We are less than a mile from the San Andreas fault, and so was the epicenter, so quakes are no surprise. No damage. But the sound is imprinted in our minds. We could even tell which direction the quake came from, because that was the direction of the sound, like a giant engine roar. This long rumbling roar preceded the quake by several seconds. I guess the sound waves travel faster than the earthquake waves. The electricity for the whole town went out for a spell. Every integer on the the magnitude scale of earthquakes is ten times stronger than the one before it. A 5 is ten times a 4, a 6 ten times a 5. The Sendai 8.9 earthquake was 10^5, or 100,000 times more energy than our minor earthquake today. It’s hard to imagine what one that is one hundred thousand times more powerful would feel — or sound — like at the epicenter.